5 ESSENTIAL JUVENILE TRACKS Juvenile “Ha” 400 Degreez 1998 Even so-called hip-hop “purists” couldn’t front on this Cash Money masterpiece. Juvenile “Back That Azz Up” 400 Degreez 1998 This club staple helped Juve sell more than five million copies of 400 Degreez. Juvenile “U Understand” G Code 1999 Mannie Fresh is the producer, but the beat is just blaze. Juve completely murders this track and all playa hatas within earshot. Juvenile “Set it Off” Project English 2001 Juvenile once said that he signed with Cash Money to rap over this beat. The retooled underground classic sounded ficka, ficka, Fresh. Juvenile “In My Life” Juve the Great 2003 On this reunion track, Juvenile and Mannie Fresh prove why they’re the hip-hop equivalent of Montana to Rice: touchdown. Since almost every great rap marriage has ended in some sort of acrimony, it’s good to see brothers swallow their pride. caught very little of what Juvenile said the first time I saw the video for “Ha,” but one thing was for certain – it was on fire. His unique Cajun-flavored flow was simplistic, yet intoxicating. Even clubgoers as far away as the notoriously fickle crowd of New York City’s infamous hip-hop club, The Tunnel, couldn’t resist. Juve’s tantalizing mix of raw urban reality and rhythmic delivery captivated listeners. Born Terius Gray, the rapper learned the importance of engaging an audience in the early ‘90s alongside legendary turntablist DJ Jimi. 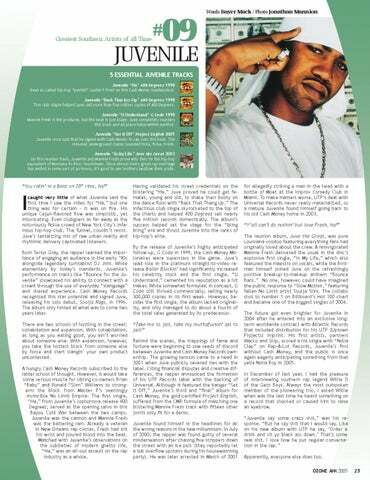 While elementary by today’s standards, Juvenile’s performance on tracks like “Bounce for the Juvenile” showcased his ability to connect with a crowd through the use of everyday “slanguage” and shared experience. 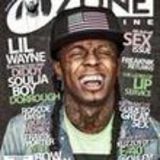 Cash Money Records recognized this star potential and signed Juve, releasing his solo debut, Soulja Rags, in 1996. The album only hinted at what was to come two years later. There are two schools of hustling in the street: cohabitation and expansion. With cohabitation, as long as you eating good, you ain’t worried about someone else. With expansion, however, you take the hottest block from someone else by force and start slangin’ your own product uncontested. A hungry Cash Money Records subscribed to the latter school of thought. However, it would take some serious muscle for sibling co-owners Brian “Baby” and Ronald “Slim” Williams to strongarm the block from Master P’s seemingly invincible No Limit Empire. The first single, “Ha,” from Juvenile’s sophomore release 400 Degreez, served as the opening salvo in this Bayou Cold War between the two camps. Juvenile was the cannon and Mannie Fresh was the battering ram. Already a veteran in New Orleans rap circles, Fresh had slit his wrist and poured blood into the beat. Matched with Juvenile’s observations on the subtleties of modern ghetto life, “Ha,” was an all-out assault on the rap industry as a whole.